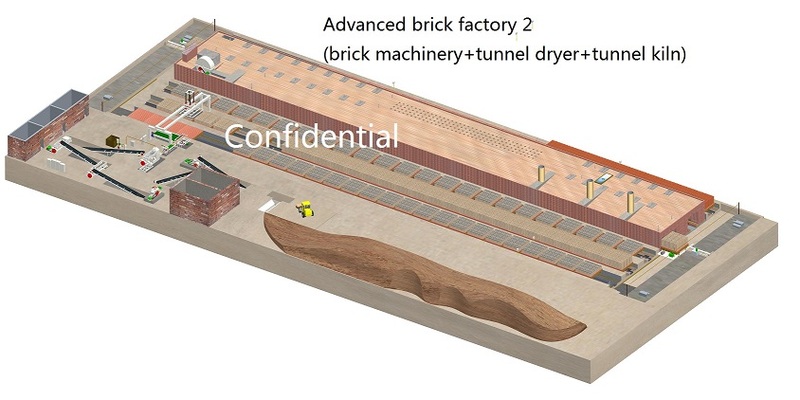 This brick factory adopts the once setting process that is semi-stiff extrusion, drying by the tunnel dryer and fired by the flat ceiling tunnel kiln. The dryer adopts brick-concrete structure, pre-cast concrete roof. Green bricks are set directly on the kiln cart. Tunnel kiln is equipped with complete smoke exhausting system, cooling system, heat extracting system, under-car pressure balance system and monitoring system. The firing schedule will be more reasonable through the adjustment of above mentioned systems. Good quality of finished product. Investment is not high compared with double setting brick factory. Disadvantages: can not produce bricks by the clay with high drying sensitivity index.